Sharing a fun layout with you today using the Picture Perfect Party suite. I am loving this dsp, it's been so fun to play with. At next weeks stamp cafe I'm doing a demo using it and I can't wait to share all that I've created - it's a LOT! I thought I'd provide you with all the dimensions to recreate this project for you today. And I've included a supply list at the bottom of this post. If you have any questions, just let me know. Add your patterned paper pieces to a 12”x12” piece of whisper white cardstock. You’ll have about a 7/8” border all the way around and about 1/8” in between each of the patterns. Add the 4-1/8” square white cardstock to the centre of the black cardstock and add that to the centre of the layout using dimensionals. Cut two 1-3/4” x 3-3/4” pieces of self adhesive sheets and add them to the back of both of the 2” x 4” pieces of black cardstock. Cut another piece that measures about ¾” x 1-3/4” and add it to the back of the berry burst cardstock. Cut the word celebrate from one of the black pieces, amazing from the other and you from the berry burst. Peel off the backing on the die cut words and add them to the layout as shown in the photo. Punch out the balloons (pool party balloon is the smaller of the two – the peach and glimmer paper are both the larger balloon). Cut four 6” pieces of whisper white twine. Using a dimensional attach twine to the back of the 3 balloons. Peel off the dimensional backing and attach the balloons to the layout. Wrap the 4th piece of twine around the strings of the balloons and tie a bow. Use a mini glue dot to hold them in place. Note: I placed it right behind the knot of the bow. All the stamped words are from the greeting in the set that says “Today we celebrate wonderful brilliant fabulous you”. Stamp words one at a time in desired colors and cut them out. You can use a piece of scotch tape to mask off the words as you stamp them or you can also use Stampin’ Write markers. 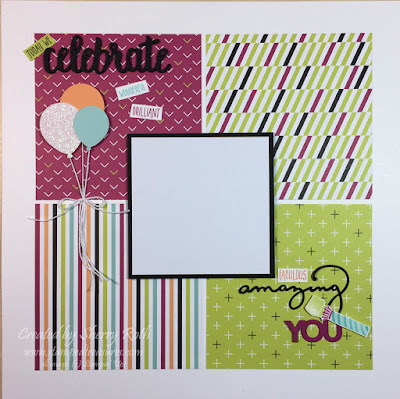 The sample has the words stamped as follows: ‘today we’ in memento ink on lime cardstock; ‘wonderful’ in Bermuda bay on white cardstock; ‘brilliant’ in berry burst on white cardstock; ‘fabulous’ in peach on white cardstock. Attach them to the layout as shown. Stamp the party blower and fussy cut. The sample has the stem of the party blower in pool party, the stripes in Bermuda bay, the tassels in berry burst and the thing that extends in lemon lime twist. Add that to the layout using dimensionals. The layout is meant for one 4” x 4” photo, however you could easily change up the size by simply changing up the mat. 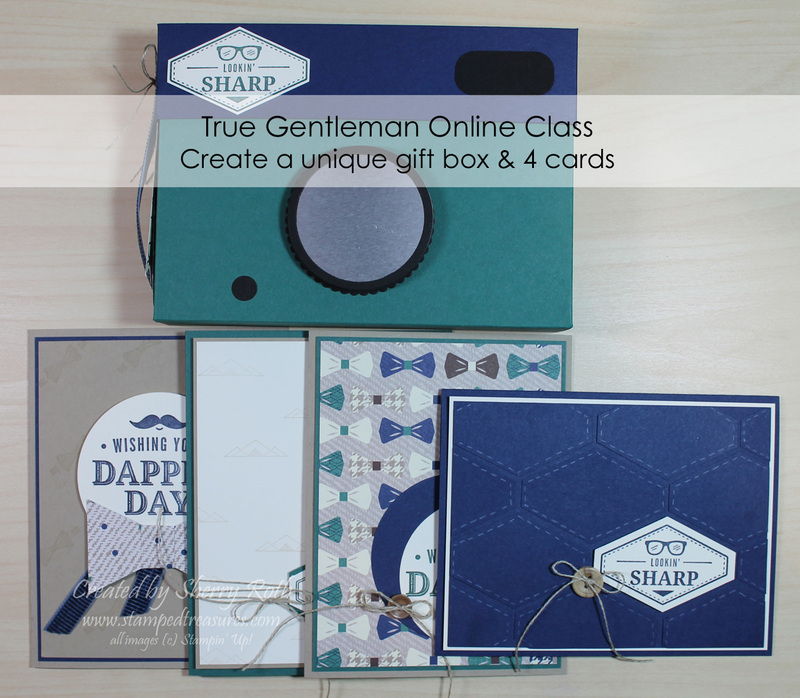 Before I sign off for the weekend, I just wanted to remind you that today is the last day to register for the True Gentleman Class To Go. 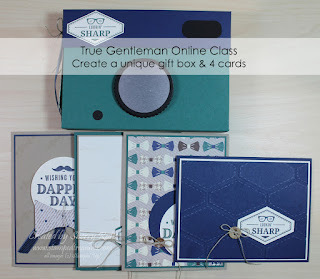 Deadline to register for the True Gentleman Class to go is February 16th.